Another highlight of our week in New York was meeting with Barbara Villet, widow of the late LIFE magazine photographer Grey Villet. In an era before any digital tinkering with his results was possible,Villet's was a technique that required intense concentration, patience and understanding of his subjects joined with a technical mastery that allowed rapid use of differing cameras and lenses to capture and compose the "right stuff" on film as it happened. Grey Villet was born in a sheep herding center called Beaufort West in the Karoo desert of South Africa in 1927. While he was still a boy his doctor father moved the family to Cape Town where he grew up. His father expected him to follow him into medicine and Grey was duly enrolled in the pre-med program at Cape Town University. It didnt take; he spent most of his time at a cafe downtown where there was music and a lot of smoke...At about this time his sister's fiance gave him a camera and that did take...It was the excitment of seeing his own pictures emerge in a friend's dark room that set the course of his life. By the late 1940's, his despairing father sent him to London to study photography---but after a few months Grey left school to earn a meager living doing wedding snaps outside the Registry while living in a trucker's stop hostel. At 20 he landed a job on the Bristol Evening News--and within 2 years had moved up to Reuters International in London on the strength of his newspaper work. At 24 he returned to South Africa and a job at the country's leading newspaper, the Johannesburg Star--but the pomposity of management's objection to his disheveled look after a night of chasing a rough news story decided his future. Already determined to become a "magazine photographer" he quit the Star on the spot and soon set off for New York hoping to land a chance at LIFE magazine. With no connections, little money, and a new wife who was expecting a child. he spent most of his time bending iron for a furniture wholesaler until he approached the personnel department at Time Inc. with his portfolio...They sent him to see John Bryson, then picture editor at Life who saw talent in his work and gave him the test assignment still titled in LIFE records as "Pigeon Man"
So it was that Grey's Villet’s career with LIFE magazine began in April of l954 on the outer ledge of a Manhattan skyscraper high above 42nd Street and 5th Avenue. He had come to this perilous perch when that trial assignment from Bryson to photograph a man said to feed thousands of pigeons at the New York Public Library had proven worthless. 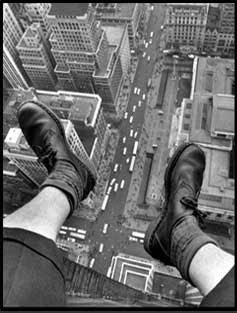 With hopes of working for the magazine in jeopardy, he had taken himself to a a nearby office building, ridden the elevator to a 55th floor and asked a group of office workers on lunch break to “take a picture out the window.” Folding his 6’4”frame out onto the narrow ledge,he leaned forward to shoot straight down over his dangling feet before horrified office workers could pull him to safety. Bryson found the resulting 3 images on the single contact sheet that the newcomer from South Africa turned in later that day. What he saw was not just a stunning image that LIFE week as its “Speaking of Pictures,” but precisely the sort of resourcefulness the editors looked for in photographers. In retrospect, Grey’s sensational edge of the ledge image could be viewed as a metaphor for what was to follow. Not only did it speak of the courage, ambition, and inventiveness that would carry him to the top of his chosen profession, but of the heightened perspective that working for LIFE would afford him for decades to come. The New York Times Lens Blog published a wonderful feature on Grey Villet, edited by Stephen Crowley. Barbara Villet is hard at work on a book about her husband; she has become a determined advocate for her husband's tremendous legacy of photojournalism. We are extremely pleased to represent a select collection of vintage prints from her collection, and look forward to sharing more news about this very important photographer with our readers in the near future. 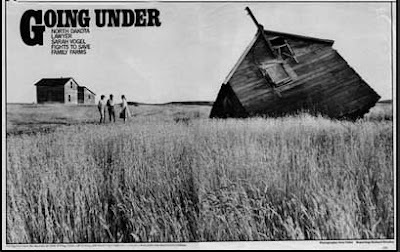 "Going Under," an examination of farm foreclosures in the 1980's, published in Life. One of the most important international photography events, The AIPAD Photography Show New York, was presented by the Association of International Photography Art Dealers (AIPAD) from March 18 through 21, 2010 at the Park Avenue Armory. More than 70 of the world's leading fine art photography galleries exhibited a wide range of museum-quality work including contemporary, modern and 19th century photographs, as well as photo-based art, video and new media. Monroe Gallery of Photography was located in Booth # 317, and we presented a special selection of some of the finest examples of 20th and 21st Century photojournalism and humanist imagery. The New York Times review of the show selected Monroe Gallery from the more than 70 exhibitors, mentioning Eddie Adams' iconic Street Execution of a Viet Cong Prisoner, shown in a very rare sequence of three prints. We were very honored to welcome many of our esteemed photographers and their families to our booth throughout the show. We would like to graciously say "thank you" to all who attended, it was a wonderful week in New York. We exhibited several historic photography by the renowned LIFE magazine photojournalist Bill Eppridge, including selections from his coverage of "Mississippi Burning" the James Cheney Funeral; and the 1968 presidential campaign of Robert F. Kennedy; which attracted the atention of galleriest's James Danzingers' "The Year in Pictures" blog. On exhibit was Eppridge's shocking burned master print Robert F. Kennedy's assassination, which was the subject of several reviews of the show, incuding the prestigious DLK Collection Blog, which commented: "This booth was filled with top quality photojournalism, and the image below from the aftermath of the assassination of Senator Robert Kennedy shows how a photograph can be tranformed into an amazing artifact - the only remaining original master print of this poignant moment has been ravaged by fire." We left Santa Fe just as a snowstorm was approaching, and arrived in New York just as a major wind and rain storm was departing. Set up for AIPAD The Photography Show commenced Tuesday at 3 PM. More posts about the Show will be posted here in future installments. On Wednesday, March 17, Saint Patrick's Day, Monroe Gallery of Photography received the Alfred Eisenstaedt Award for Excellence in Photography at a special breakfast ceremony at the Time/Life building in Rockefeller Center. 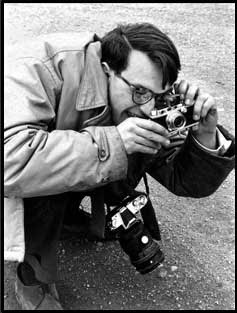 Among the attendees were legendary photographers John Dominis, Bill Eppridge, Neil Leifer, John Loengard, and Bill Ray. Also attending was Barbara Villet, widow of the late Grey Villet. The Alfred Eisenstaedt Award for Excellence in Photography was instituted in 1998 by Life magazine, also known as "the Eisie", after the pioneer of photojournalism who died in 1995 at the age of 96. Sidney and Michelle Monroe met Eisie in 1986, and he inspired and informed their path as galleriests specializing in photojournalism. Past recipients of the award include Bruce Weber, David La Chapelle, Gordon Parks, Stephen Wilkes, and Sir Edmond Hillary. "In honoring Sid and Michele Monroe, we honor the photography of LIFE Magazine and therefore we celebrate the Photographers whose images made LIFE Magazine the most famous American Magazine of the 20th Century. How amazing is it that a collection of photography produced over a 36-year period, ending in 1972, lives-on more than a quarter century later? Yes, it is due to the passion and dedication of these amazing photographers, but also due to the passion and dedication of countless editors, researchers, archivists, publishers and business people whose efforts have helped make LIFE photography visible to the world - to this day. In fact in 2009 LIFE Books published 16 books and bookazines printing over 4 million copies and LIFE.com, which launched one year ago, reaches over 3 million unique users per month and generates over 35 million monthly page views. And beyond these folks, the power of LIFE photography has been perpetuated through the passion of LIFE’s readers and fans, curators, collectors, art dealers and, I think safe to say, everyone in this room. But today we single-out two people’s passion for LIFE. A passion that has achieved the sale of more LIFE photographs than any other single gallery and therefore contributes to our continued celebration of LIFE’s amazing Photographers." "Good morning; it is so nice to see you all here today. For those of you who may not know me, my name is Regina Feiler and I have been the Director of The LIFE Gallery since 2007. Most days, I really, really like my job; today, I am awed by it. It is truly something to have daily access to material that literally captures this nation’s history; as they say, a picture is worth a thousand words. It is quite another to have the privilege to speak to the men and women who can actually augment those images with their own words, if I just ask, and you can be sure, I do, as often as possible. In this room are the tales of Robert Kennedy; of Muhammad Ali; of Marilyn Monroe singing to the President; of Frank Sinatra and Steve McQueen; Woodstock and the Beatles. While we have done, and continue to do much in this organization to further the message of the original intent; to create and feature the greatest, and unparalleled photojournalistic brand ever created, there is one person who rises above the rest OUTSIDE of this organization in doing so. "Sid first developed a passion for LIFE imagery in his days at the Circle Gallery here in Soho. In Sid and Michelle’s move to open their own gallery in Santa Fe, their passion for LIFE’s photography is what drove them from the day they opened to feature LIFE imagery as prominently as they do. But it wasn’t just the imagery that set the spark; and I know that, because Sid said it himself in 2007. "…at the beginning of my career in the gallery world — to meet Alfred Eisenstaedt and work with him — set a spark, because I discovered I had this great admiration for the field of journalism and the pioneers who made picture journalism what it was, and what it became over the ensuing years. It was like joining a fraternity because almost all of these photographers were familiar with each other… [A]s we became known as specializing in photojournalistic works, one by one, more and more, came on board. So that’s really been our core focus, and particularly in the seven or eight years since we moved to Santa Fe." And if the above weren’t true, would so many photographers be sitting here in this room today to honor Sid and Michelle?" We were very humbled to receive an award named for the very photographer who inspired us, over 25 years ago. However, in truth, this award belongs to each and every photojournalist we have been privilaged to have known and represent - it is they who make us look good. Part two of Monroe Gallery in New York to follow! The 30th annual Association of International Photography Art Dealers Photography Show is now open, through Sunday, March 21. 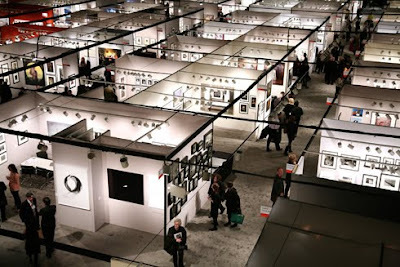 The show is at the Park Avenue Armory, 643 Park Avenue (between 66th and 67th Streets). Friday's New York Times has a review of the show mentioning Eddie Adams iconic Street Execution of a Viet Cong Prisoner, shown in a very rare sequence of three prints. 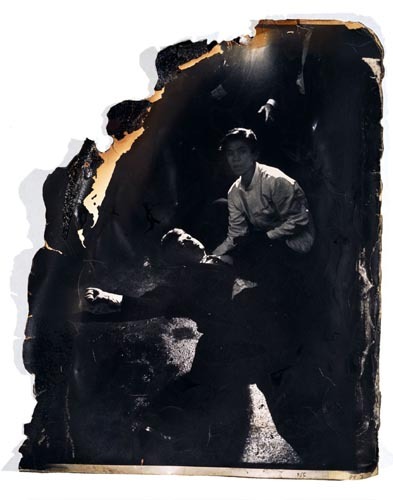 Also on exhibit at Monroe Gallery is the shocking burned master print of Robert F. Kennedy's assassination, as shown in this blog. We have welcomed many of our esteemed photographers to our booth, # 317. Here are just a few highlights, we hope to see you Sunday - John Dominis will be among our guests. Monroe Gallery of Photography will be exhibiting at the AIPAD Photography Show March 18 - 21. Watch this blog for updates! The longest running and one of the most important international photography events in the world, The AIPAD Photography Show will be presented by the Association of International Photography Art Dealers (AIPAD) at the Park Avenue Armory, 643 Park Avenue (between 66th and 67th Streets). More than 70 of the world's leading fine art photography galleries will present a wide range of museum-quality work including contemporary, modern and 19th century photographs, as well as photo-based art, video and new media, at the Park Avenue Amory in New York City. Monroe Gallery is located in Booth # 317, near the Cafe. The 30th edition of The AIPAD Photography Show New York will open with a Gala Preview on March 17 to benefit the John Szarkowski Fund, an endowment for photography acquisitions at The Museum of Modern Art in New York City (call 212-708-9680 for further information). Additional special events, seminars, and lectures are scheduled for Saturday, March 20 and Sunday, March 21, including "A Conversation with Members of the Photo League" with Monroe Gallery photographers Vivian Cherry and Ida Wyman. Thursday, March 18 11:00 a.m. to 8:00 p.m.
Friday, March 19 11:00 a.m. to 8:00 p.m.
Saturday, March 20 11:00 a.m. to 8:00 p.m.
Sunday, March 21 11:00 a.m. to 6:00 p.m.
Saturday, March 13, 2010 at 3:30 a.m.
Pulitzer Prize-winning photographer Charles Moore died Thursday at his home near West Palm Beach, Fla.
Moore was born in Hackelburg and rose to fame in the 1950s and 1960s as a result of his almost accidental career as a photojournalist. As the lone photographer on the scene at Martin Luther King Jr.'s arrest in 1958, he captured the violence and emotion inherent in the scene. In the years that followed, Moore would take some of the most enduring shots of the Civil Rights Movement: the Selma march, the riots at Ole Miss and the tragedy of the hoses and dogs turned on those in Kelly Ingram Park in Birmingham. For much of his career, he worked for Life magazine. Shannon Wells, the photographer at the University of North Alabama who worked with Moore throughout her career, said his influence on photography will not soon be forgotten. Moore was often in Florence to share his work and expertise. "What can you say? He was an icon," she said. "He always took the time to teach and mentor other photographers, especially young photographers. He always wanted to share his career." In 1991, a chronological collection of his photographs as well as his biography was printed as "Powerful Days: The Civil Rights Photography of Charles Moore." Andrew Young, who wrote the introduction to the book, said the Moore's photographs are the legacy of what those who lived through the Civil Rights Movement endured in order to find equality. "Many of us were treated like rats, even during the most daunting days of the movement, as Moore's photographs of the fire hose attacks in Birmingham's Kelly Ingram park graphically illustrate," he writes. "All of us must hope and pray that the lessons learned and the lives lost during the first years of the movement will be remembered and honored to infinity." A memorial service for Moore is planned for later this year. Monroe Gallery of Photography will exhibit several of Charles Moore's photographs during the AIPAD Photography Show March 18 - 21. Labels: Bill Eppridge Civil Rights photographs, Martin Luther King Jr.
As I stood in front of a 1972 photograph of David Bowie, Iggy Pop and Lou Reed arm-in-arm, I wondered if I was able to accurately assess the image. Had the photographer captured something special with brilliant timing and just the right amount of coaxing? 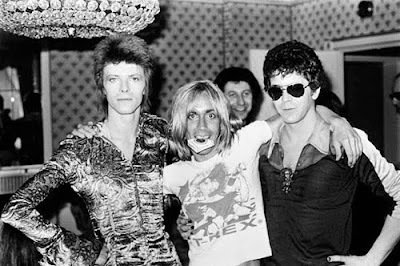 Or was I drawn to Bowie’s piercing eyes, Reed’s impossible hipness and Mr. Pop’s bared teeth clutching a pack of Lucky Strikes? In other words, was this an iconic image or just an image of icons? If one wanted to criticize Monroe Gallery’s The Art of Sound, it might be on the grounds that some of the pictures are noteworthy only for whom they depict—fame by association. Nevertheless, as a lover of photography and classic rock, I had a blast. Celebrity portraiture is a tricky proposition. To be totally effective, it often requires that the viewer have a priori knowledge of its subject. But this is exactly why the show is so fun. Done well, the photographs themselves become inseparable from the celebrities within them; the photographs become part of celebrities’ images, freezing something about them that stands in for the truth. Whether the photographs help create the vibe or just a record of it, they bring to mind sounds and stories of their subjects. One close-up shows Louis Armstrong’s fingers as he smears balm across his ample, voluminous lips. Immediately I could imagine the bright, clear attack of his powerful horn. Another standout is a grid of images that show Jimi Hendrix performing live. Each shot is composed the same, from the waist up, but Hendrix’s guitar face moves from the meditative to the orgasmic, and it is impossible not to hear the virtuosic roar and flutter of his incomparable solos. The exhibit teeter-totters between documentary and formal portraiture, and there are masterpieces of both. “Hullabaloo with Chuck Berry, New York” shows the bizarre set of the televised music program, replete with go-go dancers, men in matching referee jerseys and a seated audience in heavy horn-rimmed glasses. Squished into the lower left corner, Berry is hardly in the picture at all. A portrait of Igor Stravinsky is obviously posed, much quieter, but no less stunning. The photographer, Arnold Newman, also placed his subject in the lower left. The remainder of the composition is filled with the stark geometry of a lifted piano lid. From across the room, the image resembles a black-on-white modernist painting more than a photograph. Another enjoyable aspect is the apparent duality of the photographer and the camera. The images may seem reverential or composed in a flattering way, but the camera is still a faithful, if dispassionate, surveillance tool, catching the details that nowadays would be airbrushed into oblivion. I was surprised to note Elvis’ blackheads or the stubbly underarms of The Supremes. But this only reinforces the sense of immediacy, the proof that these are real people—a fact remarked upon with disgust and bewilderment by present-day tabloids that show stars without make-up or with embarrassing beach bodies. I don’t think that’s quite right. There’s actually a pretty narrow focus to the work, which is primarily from the ’50s, ’60s and ’70s. But if you like that era, The Art of Sound does a great job of touching on some of the biggest acts in music before video killed the photography star. The exhibition continues through April 11. Joe McNally climbs to the top of the Empire State Buildingto get "the ultimate light bulb changing shot" for the National Geographic story "The Power of Light"
We are very pleased to welcome Joe McNally back to Santa Fe for two weeks. Joe is leading the Digital Landscape Workshop Series in Santa Fe March 7 - 10, and the Location Photography and Lighting workshop March 10 - 4 at the Santa Fe Workshop. Both are sold out! Here are the details, book now for next year! DLWS is heading to what seems like Joe's 2nd home for a great week of fun and killer photography. We have the SouthWest as our subject with vast landscapes and old spanish style architecture. As a special treat, we'll be shooting at the old, historic and infamous prison one morning and one evening. And you just never know what other special surprises we have in store. We're been planning this one for some time so we are really excited for to smack some chilies and see that romantic sunset. We're staying at the very romantic, pictursque Bishop's Lodge where we've secured a killer rate for our participants. We can easily see this becoming one of our favorite locales! Much of what professional photographers are called on to do is done on location, including scouting a location, using existing and artificial light creatively, and dealing with physical space. The Digital Landscape Workshop, designed for experienced photographers who want to become more proficient in the use of light in the field, is about learning how to size up a location and find the best angles and light for the assignment. "We look at the use of natural and artificial light, including reflectors and large strobes as well as small flashes, to photograph both exterior and interior portraits, large and small spaces, street scenes, and people in all types of situations and locales. Emphasis is placed on how to “write” with light and how to use lighting techniques to shape the mood and color of a photograph. We explore color temperature, ways of working with natural light and strobe, and how to mix the two effectively." Joe discusses lighting issues that arise in the field when using small, on-camera speedlights as well as the issues of huge productions involving larger studio strobes. He also covers gaining access to locations, methods for covering magazine assignments, and blending a variety of techniques and approaches. Working in the studio and on location, we photograph specific assignments with critiques the following morning. Also discussed is the simple fact that where you put the camera is much more important than where you put the light. It all goes together—a point of view at the lens, and command of the language of light to articulate that point of view. By the end of the week, participants have confidence in their ability to use light and lighting systems in a variety of conditions. By sheer coincidence, Joe's photographs "A Great Day in Jazz" and a 2006 portrait of Tony Bennett are featured in the current Art of Sound exhibition. Joe has two best-selling photography books out now, The Moment it Clicks and The Hot Shoe Diaries. Joe is a 25-year contributor to National Geographic. As part of the World Expo 2005, he created a photo diary of the New York City Opera’s historic first tour to Japan. Joe’s work has won numerous awards and appeared in a variety of publications, including The New York Times Magazine, National Geographic, Newsweek, ESPN The Magazine, Men’s Journal, LIFE, and Fast Company. His advertising and marketing clients include Nikon, Sony, Lands’ End, MetLife, Lifetime, AGA Marketing, Wildlife Conservation Society, American Ballet Theatre, and FedEx.